Google Plus is gone and now Google is set to shut down inbox for Gmail in 15 days. Google has officially announced that it is shutting down its Inbox by Gmail app at the end of March 2019. The app remained as a great platform for Google to experiment with new ideas like snoozing emails to later, AI-powered experiences like Smart Reply, Nudges and high-priority notifications and more. Four years after launching the app, Google has migrated most of its features to the flagship Gmail app. 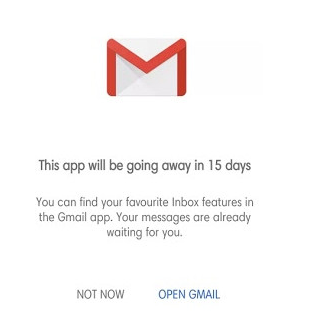 …and now, Google is already displaying that the app will be shut down in 15 days time.